GLOBALLY TRUSTED TOYOTA HILUX REVO VIGO EXPORTER FROM BANGKOK THAILAND-— You’ve arrived at a true one stop shop for purchase of all your 4×4 automotive needs at unbelievably best and cheapest possible prices. If you are looking to buy and import thailand assembled 4WD pickup truck Toyota Hilux Vigo and Fortuner, then this is the right place. We can supply all these pickups with full range of their spare parts. We are humbled to be the top best export dealer of Toyota Vigo Double Cab, Smart and Single Cabs. Grades 2.5 E 4×4 and 3.0 G are best sellers and Toyota hilux REVO. Allow us a chance to be your exporter of choice, you will get unparalleled after sales support i.e. any spare parts or accessories you would need in case of unfortunate breakdowns or accidents. We promise to provide an extremely quick response to all your queries even after work hours. You wont find this dedicated service anywhere else guaranteed. This isn’t just a claim but we can prove it with references from our global client base. 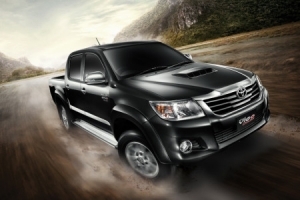 This has established Hilux Motors as Thailand’s leading auto exporter. Orders are pouring in like rain.Best deals and discounts are available on all pickup trucks including latest Minor Change of 2015 Toyota Hilux Vigo Champ.Ready Availability FOR MOST OF THE POPULAR COLOURS WITH IMMEDIATE SHIPMENTS worldwide.Minor Improvement of already popular New Vigo Champ has been released. Other than that, all other Major brands (Isuzu Dmax V-Cross, Chevrolet, Ford, Mazda) have introduced all new shapes of their pickup trucks so indeed 2015 is the year of moving forward. Toyota Hilux Vigo 2015 Thailand is the best selling compact pickup truck, which is marketed and produced by a Japanese manufacturer named Toyota. Toyota Hilux Vigo 2015 is certainly a good choice for those who like adventures or have large family. Hilux Vigo Thailand is a legendary vehicle and will not bother you in any type of journey or any sort of trail. It is also known as “THE INDESTRUCTABLE TRUCK” and famous for never break down on the road. Due to its reliability and durability, the army of Finland uses it a lot as it can even go on very bad roads where no other cars can go. Thailand is a beautiful place, which is recognized as world’s 51st largest country in term of area located in Southeast Asia. Toyota is successfully selling their piece of art in this beautiful country with the help of different showrooms and dealers. Toyota Hilux Vigo Thailand is more than just a car. It can be used for travelling with your family and on the other hand it is also suitable for rally racing but this is not all, you can use your Toyota Hilux Vigo Thailand for earning money by using it as a pickup truck. Toyota Hilux Vigo Thailand is an incredibly versatile vehicle, offering outstanding degrees of comfort for a occupants along with incredibly flexible use of space. Toyota Fortuner is one of the best selling SUV car in Thailand which are available in 4×4 & 4×2. It is also available in Diesel & Petrol which do have fuel consumption of 2.5D4D, 3.0D4D and 2.7 VVT-I. Isuzu is being manufactured in SUV which is also known as MU7, vehicles which caters the needs and requirements of selective users who approach us to fulfill their required standard. The Toyota engineers have certainly worked hard and long for this model of Hilux Vigo Single Cab. In order to advance the stopping of the car the vehicle has some exclusive features where the rear axle and front shock absorbers, front brake discs are ventilated with a larger diameter. At Hilux Motors(vigo4u) Thailand we offer the best selling pickups in the world because Toyota Hilux Vigo Single Cab are able to satisfy the needs of people who are in need of this type of pickup truck. We provide the most competitive prices including secured shipping all over African Regions, Caribbean and Asian Regions in order to export the vehicle to you safely. Hilux Motors Thailand has been exporting the Toyota Hilux Vigo Single Cab Thailand manufactured all around the world. So with the latest improvements and advanced features Hilux Vigo Single Cab has certainly become even more desirable. We can also provide you a customized vehicle installing accessories according to your requirements. Providing a vast range of variety in interior and exterior accessories to personalize your pickup.